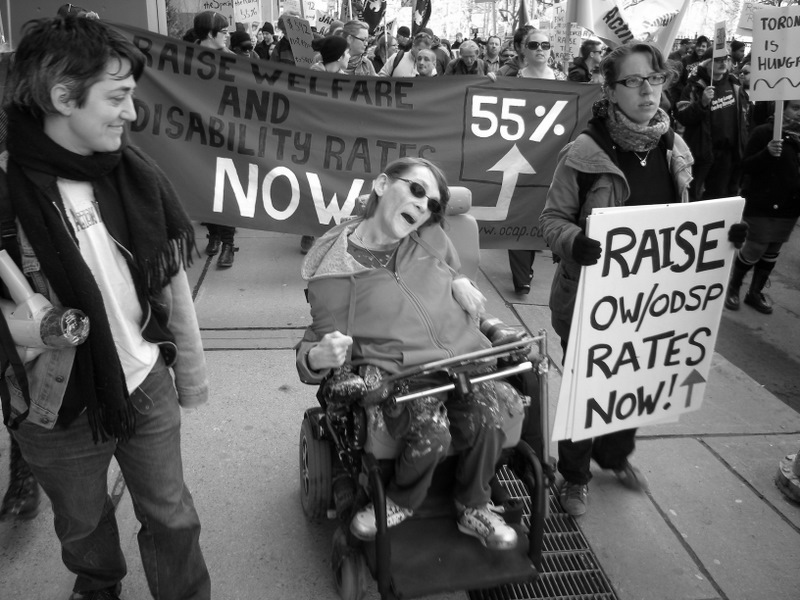 On New Year’s day 2014 there’s not much to celebrate for those who are unemployed, low-waged, who rely on welfare, or live on disability benefits in Ontario. To make matters worse, only 35 per cent of the unemployed even qualified for Employment Insurance benefits (which have been reduced), compared to 74 per cent eligible in 1990. Two priority campaigns of the Ontario Coalition Against Poverty (OCAP) highlight this reality. 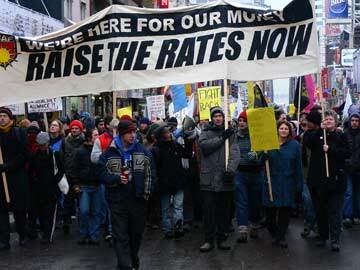 The first is the campaign to “raise the rates”. The rates paid by Ontario Works (welfare) were brutally slashed by nearly 22% by the notorious regime of Mike Harris in the mid-90s. Since then, for single claimants, the payments have lost a staggering 56% of their spending power. These rates were frozen since 1995, until the advent of the present Liberal regime, but any increases have been miniscule – only 15% over the last ten years, far less than the rate of inflation. 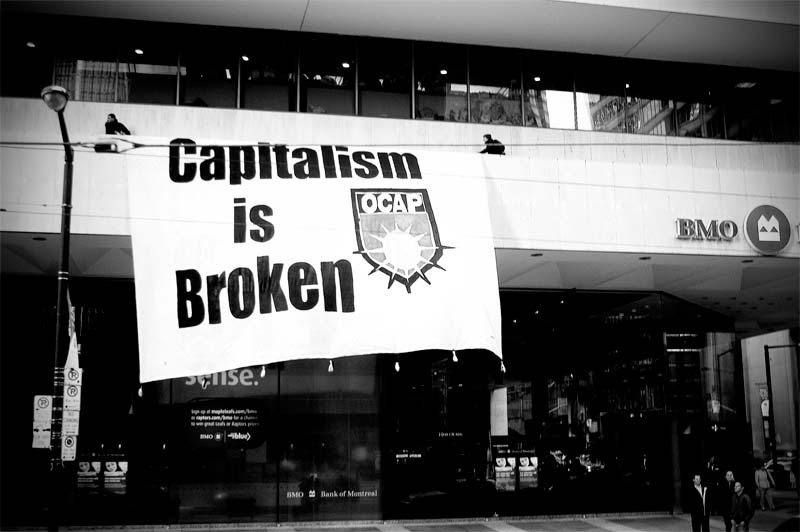 OCAP demands an immediate 55% increase. It is common knowledge that welfare recipients have little left over after paying rent. They rely on food banks to survive and have almost nothing for other needs. Supplementary benefits have been under continuous attack, despite the laughable “poverty reduction” mantra of the austerity-mongering Wynne government. As OCAP organizer John Clarke wrote in the Bullet (May 2013): “The fundamental nature of the welfare system can be traced all the way back to its roots in the old English Poor Laws. The system has always been there to reluctantly provide enough assistance to stave off unrest and social dislocation, but to do so at levels and in forms that maximize the flow of labour into the lowest paying and most exploitative jobs on offer.” “Ontario Works” says it all. The same approach to disability benefits leads into a second major campaign to prevent the merger of Ontario Works and the Ontario Disability Support Program (ODSP). At a November 20 rally in Toronto, attended by over 120 people, speakers outlined their concerns. Historically, disability and welfare rates have been separate. If combined, from where will any increases for disability come? With downloading to municipalities, will ‘reassessment’ of disability claimants follow the notorious British model? Rally participants learned about the savage cuts to disability programs by the reactionary coalition government in Britain, which has handed this process over to ATOS, a private company. Huge numbers of people there have been disqualified on incredibly specious grounds. A video showed a large field of flowers, each representing a disabled person who died within a short period of being disqualified, often by suicide. It is hardly ‘alarmist’ to think that the same could happen here, since the Ontario Workplace Safety and Insurance Board (WSIB) has already privatized reassessment with a stupefying increase in disqualifications. The austerity agenda, which has particularly targeted disabled people, is international, as is the capitalist system, which promotes it in the interest of ever cheaper labour platforms. These two campaigns by OCAP clearly merit the unqualified support of labour, the left and social movements. Attacks on welfare and disability benefits will not only further impoverish poor people, but everyone. The greater the number of people desperate enough to accept the most wretched jobs, the more downward pressure there will be on wage levels, and the more intense will be the attacks on unions.